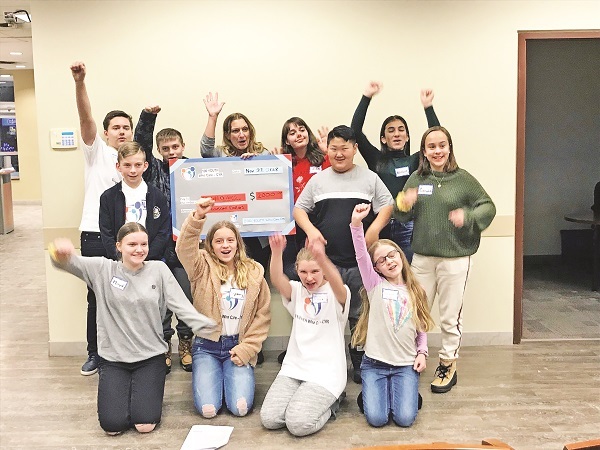 100 Youth Who Care York Region celebrated its second anniversary of giving back within the community by providing a $660 infusion to the Aurora-based Kerry’s Place Autism Services on Wednesday night. The group of York Region teens met November 21 in conjunction with meeting of 100 Women Who Care Newmarket-Aurora, bringing their total contributions to local non-profits to over $5,700 to date. 100 Youth Who Care is a local offshoot of 100 Women Who Care and 100 Men Who Give A Damn. Meeting quarterly, each participating youth brings $10 to the meeting along with nominations for worthy organizations, armed with information to make a successful pitch to their peers. Following the pitch by three youth after three organizations are drawn at random from a hat, the meeting’s proceeds are collected and donated to the “winning” organization. Wednesday’s meeting was twofold. In addition to raising $660 for Kerry’s Place, Jeannie O’Regan, Vice President of Special Events and Operations at the Starlight Children’s Foundation was on hand to formally accept a $2,000 cheque from the youth on behalf of the foundation – the spoils of their August meeting. “The Starlight Children’s Foundation video that Jeannie shared with our group touched all of our hearts and demonstrates the incredible impact our youth’s donation will have on the lives of other youth,” said Ms. Cooper. The next meeting of 100 Youth Who Care will take place Wednesday, February 27, from 7 – 8 p.m. at the Royal Bank, located at 17770 Yonge Street in Newmarket. In the lead-up to that meeting, the Youth have set a challenge for themselves, recruiting as many other community-minded youth they can to have an even bigger impact on York Region.